We’re deep in the heart of holiday season, and everywhere you turn you’ll see the evidence: cheap tinsel, blinking lights, and inflatable red-nosed reindeer abound. But what if you don’t like your holidays to be quite that loud? If you just can’t get on board with the traditional (and often tacky) holiday style pervading your neighborhood, you’re not alone. Rest assured that not everyone is down with multicolored light shows and the mantel lined with teddy bears dressed in holiday sweaters. So how do you show the holiday spirit instead? You can still deck the halls and keep it classy at the same time. 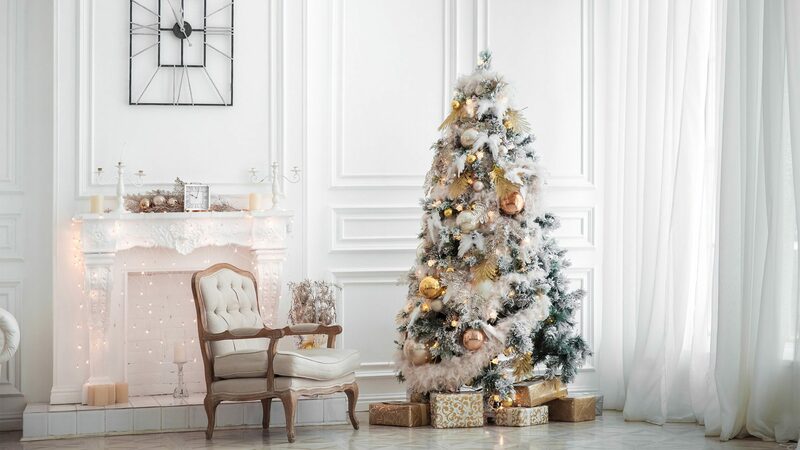 Use these designer-approved tips to take your holiday decor from garish to glam. 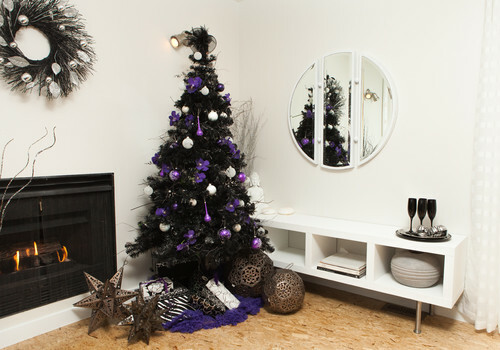 The usual Christmas hues are fine, but to up the fab factor, go beyond traditional colors. “I like to encourage clients to try indigo, scarlet, and different shades of purple,” says Julie Coraccio, a home organizing pro at Reawaken Your Brilliance. These richer colors are surprising and will pop when mixed with a fresh tree—or a light-colored artificial one. Don’t be afraid to go dark, either—black ribbon can look really classy in small doses. “Green wreaths placed over each window are simple and elegant, especially when hung with black grosgrain,” notes Ana Cummings of ANA Interiors. If you’re ditching the red and green in favor of nontraditional colors, just remember to keep it simple. Blue and silver. Gold and bronze. Or a monochromatic silver theme. Decorating with one or two colors is more chic than a jumble of tones competing for the eye. “If you don’t stick to a simple color scheme, the decorations start to look like clutter instead of elegance,” says Karen Gray-Plaisted, an interior pro with Design Solutions KGP. This same tip can be applied to your lights and flowers. Tiny white or opaque lights are key in a glam look (larger, multicolored bulbs can look a bit garish). And rather than a riot of hues, group blooms of similar shades in silver julep cups. Can’t find an item you want in the color you’ve selected? Grab some spray paint, says organizing expert Jamie Novak. “A brown gingerbread house can be transformed with a quick coat of gold,” she explains. It’s no secret that glass and mirrors reflect the light and brighten any decor, creating an instant glam factor. 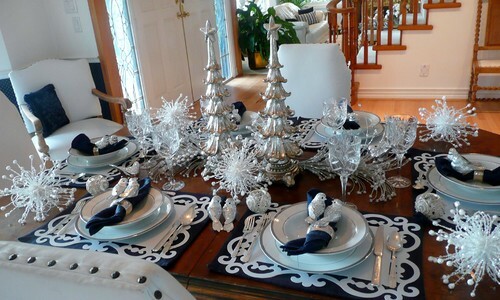 Not sure how to implement glass into your holiday decor? Try this tip from our pros: Encase your accoutrements and holiday accent pieces in a glass container. “Boxwood topiaries on a console or kitchen island are classic and can be made even more beautiful when placed under glass cloches with white lights,” Cummings says. Filling every room with bedecked trees and sleds piled with greens screams “over the top.” Instead, scale back your decor and focus on one area. 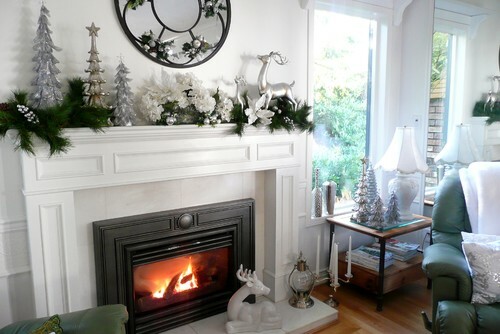 The mantel is a natural choice, since it’s usually in the center of your living room or den. Hold off on the stockings and garland and instead bring in branches and wrap them with tiny lights, suggests Bee Heinemann, an interior designer with Vant Wall Panels. Place tall LED pillar candles on top to build up the display, and then put bowls or vases filled with ornaments on each end. 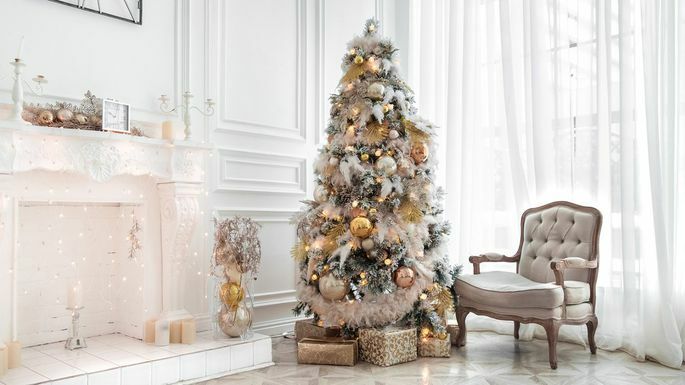 For a truly chic holiday look, the pros say you should consider a Christmas decor scheme based entirely on different shades of white. “There’s nothing like an all-white design—it’s classic and clean,” Heinemann says. 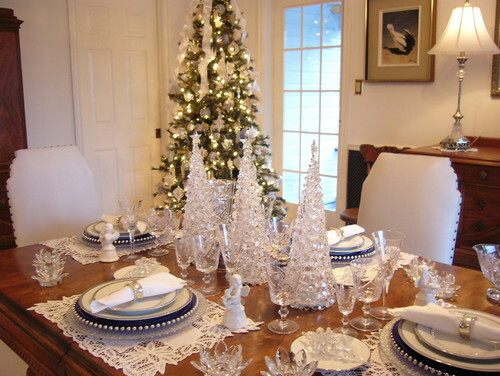 You might fill white vases and pitchers with silvery pine cones or pine boughs and line shelves with thick white felting for “snow.” An all-white Christmas tree, white poinsettias, and white candles on a creamy tablecloth are other smart ideas, she adds. Metallics give an immediate glam vibe. 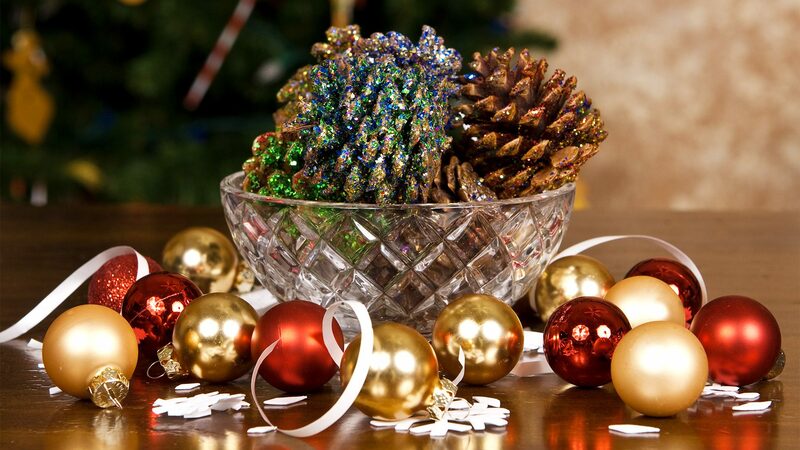 Fill a silver bowl with silver ornaments or pine cones sprayed white and then dusted with glitter, Gray-Plaisted suggests. Or pick up branches from the crafts store (or your backyard) and spray them with gold paint, then arrange them in clear vases of varying heights down the middle of your table. Simple and elegant decor doesn’t have to be real. Faux greens won’t drop needles, and your color options will broaden if you consider the fake stuff. Faux flicker candles can be grouped on the mantel or placed in entrance halls, Cummings says. 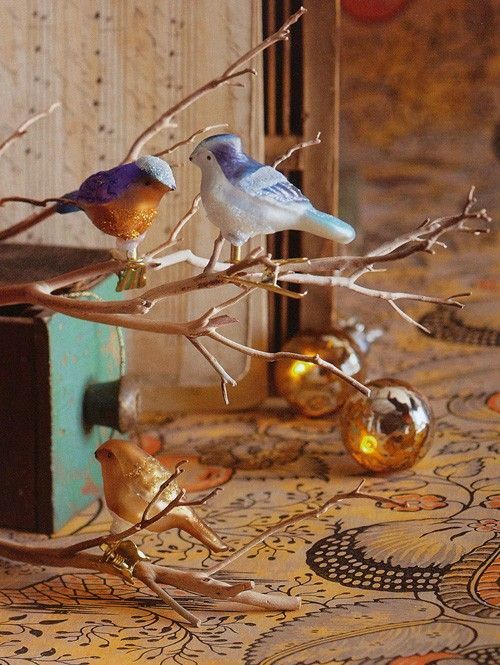 Or attach a few faux birds to some twigs in a vase. Darla DeMorrow, the pro at HeartWork Organizing, likes to embrace the faux poinsettia. “You can make them look more real by poking additional blooms into the prefab pots,” she says. 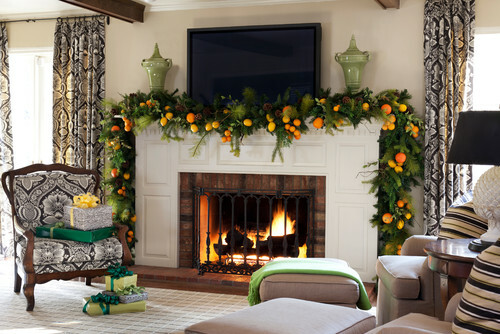 Lemons, clementines, limes, and grapefruit are as shiny and bright as any ornaments you’ll find in the attic, so put these pretty orbs to work at Christmas. Stack them on a platter or in a shallow bowl (tuck holly or greens from the yard in between the fruits), or wire a few to a simple wreath for the front door.